Self-service bicycles, scooters and cars form part of the smart city landscape. Brussels abounds with these means for getting around and which reduce the car’s footprint in the city, by replacing the model of the car as property with that of the car as a service. Brussels is even the 2nd highest placed European city in terms of the density of its shared mobility offering. People associate traffic congestion with cities since in the past so much priority has been given to being able to use cars right into city centres. Fortunately, the situation is improving. Other ways of moving around are gaining ground: collective like public transport or individual like walking, cycling or different forms of shared mobility now in full expansion. The Brussels-Capital Region is a champion in providing means of self-service mobility: a wide range of shared bicycles, scooters and cars are available. An online shopping platform, ShopAlike, has even calculated that there are 42 bikes, 8 cars and 0.6 scooters available in self-service for every 10,000 Brussels citizens. This density as regards shared mobility means that the region is in 2nd position among the 28 European capitals, behind Paris which tops this ranking. It is particularly for bikes that Brussels distinguishes itself in this shared mobility ranking in Europe. Brussels is the best European capital in this respect, according to the density of its offering and its prices which are among the lowest in Europe. With the arrival of new self-service bicycle services, electric in particular, since the ShopAlike survey (June/July 2017), this superiority will only become even more marked in the future. The success of shared mobility in the Brussels-Capital Region itself is a long way from running out of steam. Indeed, only one out of two households in Brussels owns a car (FR/NL) as shown in the results of the national survey on household budgets. Mobility is one of the main fields of action of the smart city. Mobility policies pursue objectives that are as varied as they are complementary such as reducing the pressure of car traffic or environmental pollution. 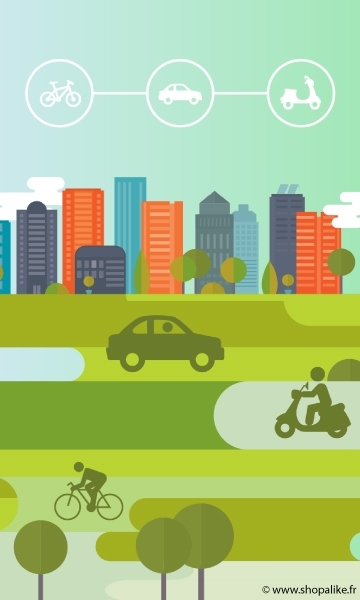 Shared mobility can rely on the development of new technologies in this respect, such as GPS geolocation, connected objects, mobile apps as well as the availability of a wide and powerful mobile Internet coverage.